Our newest Tag Builder Blueprints 6 Die-namics are perfect for creating fun shaker tags to adorn your Christmas gifts. 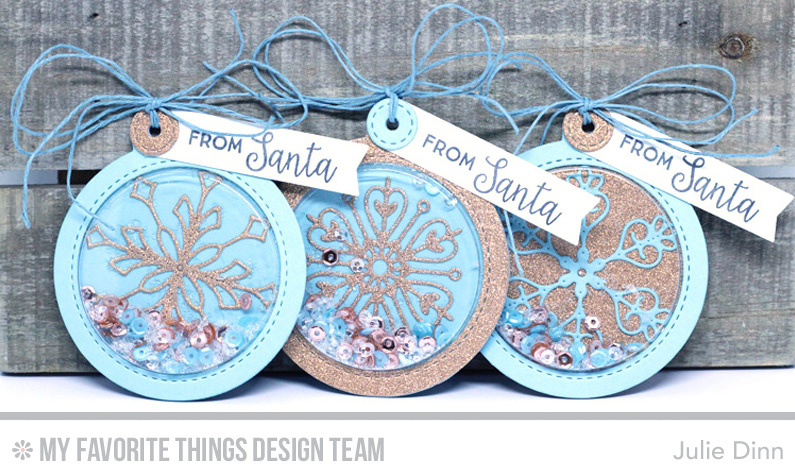 To create this trio of tags I started with Berrylicious and Copper Sparkle card stock. I filled the Shaker Pouches with Aquamarine, Rose Gold, and Sparkling Clear sequins, along with a little glass glitter. I finished off the tags with a sentiment from the Gift Tag Greetings stamp set and a bit of blue twine. How pretty! Looks like a visit to the seaside which is a good thing to me! Julie--Love your tags! Snowflakes--glitter--and Tags! Some of my favorite things! Gorgeous snowflake tags. I love all the glitter and shimmer! Shakers! You took tags to a whole 'nother level. Very pretty.